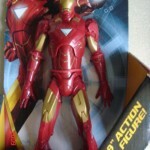 We have our first images of the Mark VI armor figure from the upcoming Iron Man 2 toy line. Click the headline of the story for both images. I hope the articulation is good but I doubt. Interesting to see Hasbro return to 8"er's. I hope that's just a packaging typo, otherwise I expect an explaination for jumping 3 suits ahead. 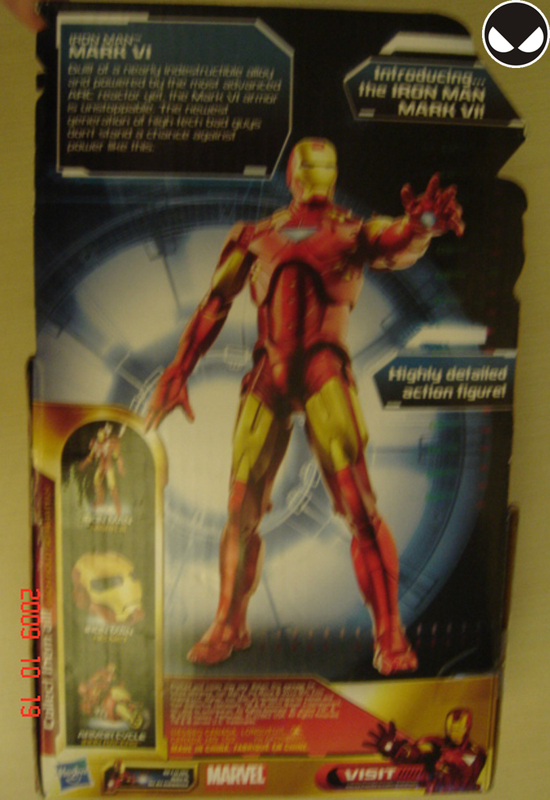 The "Mark VI" is most certainly a packaging error. 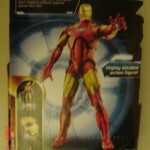 It's more likely meant to be "Mark IV", since his last suit was the Mark III. Don't like this new design. I hate the triangle chest piece. Looks terrible on that suit. The helmet's ncie, but it's barely changed if at all. I like it, but I prefer the circular arc reactor. It really isn't a whole lot different from Mark III. my only complaint so far is the triangle chest piece. the circular one looks much cooler . personally I'm more of a fan of the circular arc reactor too, its a nice suit all in all slightly changed from the mark III, as for this figure it appears to be more of a statue type figure I know there's the regular 6inch figures and also a 3.5 inch line so Ill be paying more attention to those rather then larger versions. Very cool. Can't wait to see more figures. Wha? Mk VI? Not Mk IV? Was that a typo, or does this mean Ironman 2 is going to have a Mk IV, V, VI, and maybe a War Machine still? Other than that, can't wait to see how the toys turn out besides this guy. And on the back is an accessory version either DLX 3.75'' figure, or the electronic big one with all that stuff, the IM Role Play helmet, like IM1 had, and IM on a motorcycle. Guess what guys, you are all wrong, there is a Mark IV, a Mark V, and Mark VI in Iron Man 2, and you guys need to know that the Triangular Uni Beam is better than the circular one, it's from the comics, and it's much more advanced. Source? The more I look at the pictures, the more it seems that there isn't a typo. 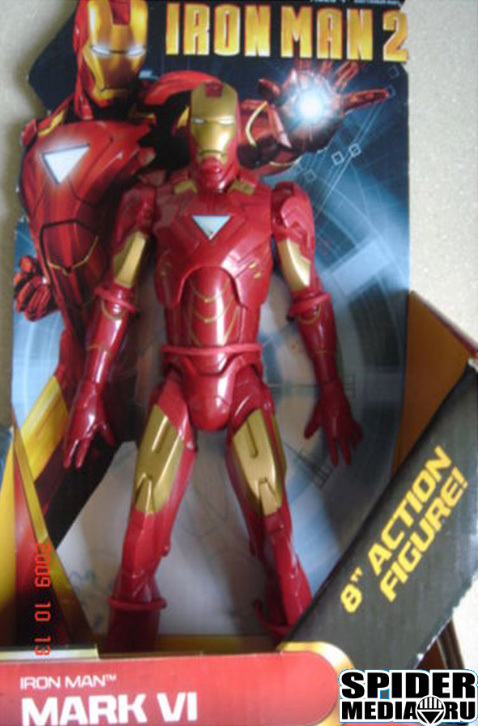 We've now seen two toys called the Mark VI. Though I do find it odd we haven't seen any Mark IV figures, while we've seen at least one figure of the Mark V and Mark VI suits. ...and you guys need to know that the Triangular Uni Beam is better than the circular one, it's from the comics, and it's much more advanced. I've always thought it was just an aesthetic thing. Though I've never read the comics, so...lol. But the Triangular Uni-Beam is stronger. And I believe the most recent nod to that in comics was in "Dark Reign The List The Amazing Spider-Man" #1-and-only. We learn Iron Patriot's uni-beam is weaker because of its shape. I think movie MKIV will be War Machine even though it may be a confiscated MKII. Guess what? I still don't like it. I know it's better, but I've always prefered the look of the circle peice. It adds more focus to the suit design wheras to me the triangle looks more like just random detailing. I stand corrected. The movie MKIV looks a lot like the MKIII Kotobukiya's ARTFX Iron Man 2 Assembly Kit Its probably the suit Tony is wearing while lounging in the giant donut sign. I kinda forgot that Iron Monger squashed most of MKIII.